This month we look at Israel’s worship as the nation descends further into idolatry and ultimately exile, yet with the promise of a future of Spirit-enabled worship. After Solomon, Israel splits into the Northern and Southern Kingdoms. 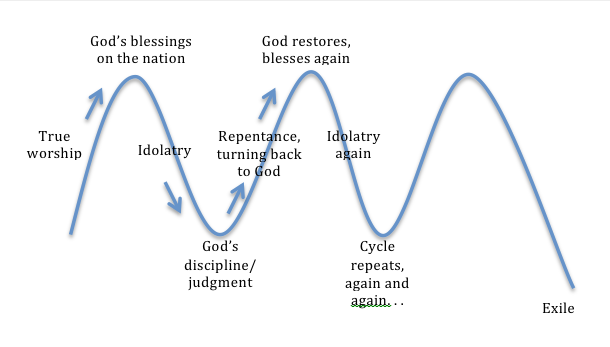 The cycles of true and false worship, and orthodoxy and idolatry, blessing and judgment continue in both kingdoms under their kings. In fact, the writers of Kings and Chronicles evaluate the reign of each king with either “he did what was right in the eyes of the Lord” or “he did what was evil in the sight of the Lord.” In each case, this assessment reflected whether the king himself pursued true or false worship, and led the people in the same direction. The success of the king was determined by the faithfulness of his worship. God through the prophets foretells coming catastrophes for both kingdoms. In that context He repeatedly condemns the practices of the priests and the people, declaring His utter hatred of the very sacrifices and festivals He had commanded in the Law—they had no meaning whatsoever to Him if they were not expressions of worshipful hearts (see Worship Notes 6.10 [October 2011]). And many nations will pass by this city, and every man will say to his neighbor, “why has the Lord dealt thus with this great city?” And they will answer, “Because they have forsaken the covenant of the Lord their God and worshiped other gods and served them” (Jeremiah 22:8-9). So we see how the worship of Israel would indeed be a testimony before the nations even in their disobedience (see Worship Notes 7.5 [May 2012]). “And I will give you a new heart, and a new spirit I will put within you. And I will remove the heart of stone from your flesh and give you a heart of flesh. And I will put my Spirit within you, and cause you to walk in my statutes and be careful to obey my rules” (Ezekiel 36:26-27). God will enable worship in a way that “the Law, weakened by the flesh, could not do” (Romans 8:3).